We are proud to announce that the Oregon Legislature has supported a $7.5 million investment in the Willamette Falls Legacy Project.The Legislature invested lottery-backed bond money in the Willamette Falls Riverwalk, which would bring visitors from downtown Oregon City to the edge of one of North America's largest waterfalls. 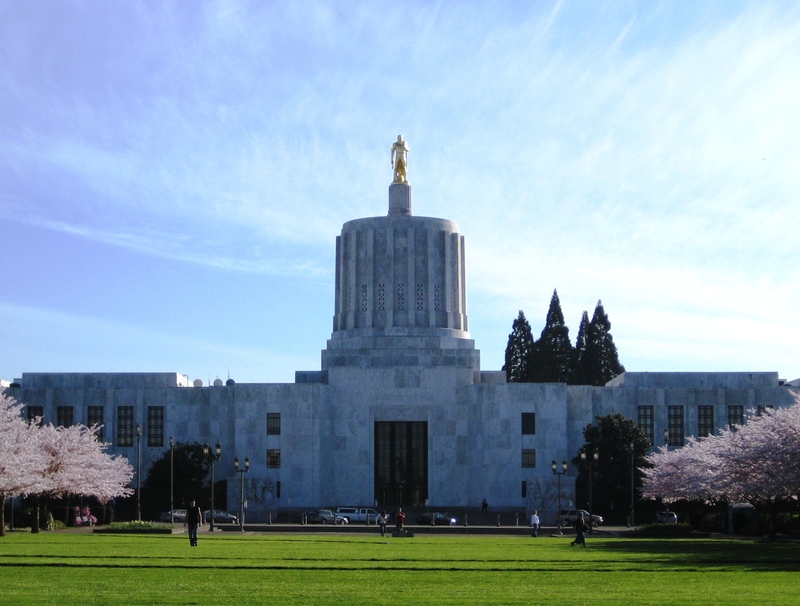 "I want to thank the many people who helped make this dream a reality,” said Rep. Brent Barton, D-Oregon City, whose district includes the falls and who championed the project this session. "Restoring public access to the falls will transform Oregon City, and my small part in this effort is my proudest accomplishment as a public servant." Oregon Gov. Kate Brown talks to former Gov. Barbara Roberts, a former Metro Councilor, and Councilor Carlotta Collette at the Willamette Falls Legacy Project in Oregon City on May 29, 2015. The state's commitment of lottery bonds complements investments of $5 million from Metro's Natural Areas bond and $5 million of lottery bonds from the 2013 Legislature. The Riverwalk is expected to cost at least $30 million. A team of Oregon City, Clackamas County, Metro and a host of state agencies, including the Governor's Regional Solutions team, the State Historic Preservation Office, Oregon State Parks and others, have been working for years to support redevelopment of the falls. Most of the property is owned by developer George Heidgerken's Falls Legacy LLC. Metro Councilor Carlotta Collette has supported the site's development since the Blue Heron Paper Mill went bankrupt in 2011. “We are excited about the Oregon Legislature’s $7.5 million investment in the Willamette Falls Riverwalk. It’s a once in a lifetime opportunity to connect the Falls to all Oregonians and reintroduce people to the power and nature of this place. We do have to keep in mind that this is also still a challenge and there is more funding to be raised. We continue to welcome support from the community to build momentum and reestablish Willamette Falls as a celebrated Oregon landmark. Clackamas County Commissioner Tootie Smith lauded the Legislature's support. “This is another positive and substantial step toward realizing our shared dream of transforming the former Blue Heron site and capitalizing on its historic, economic and cultural significance,” Smith said. Oregon City Mayor Dan Holladay thanked the Legislature for supporting the project. "Representative Barton’s continued support and contributions to this project have been critical in moving us closer to realizing public access to Willamette Falls for the first time in 150 years, removing barriers to private investment on the property and opening up new economic development opportunities on the old Blue Heron mill site in downtown Oregon City," Holladay said.